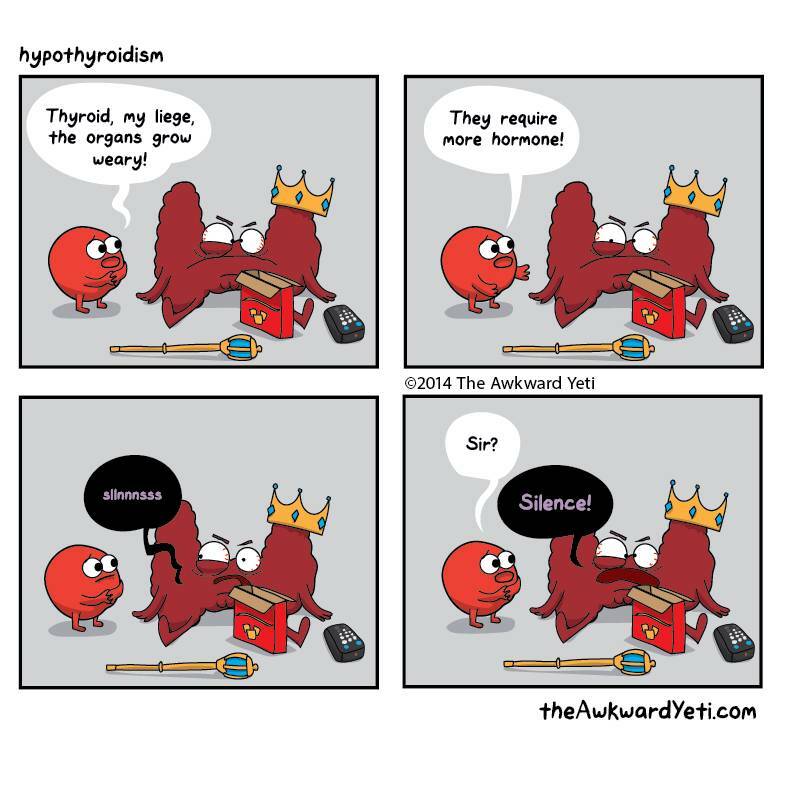 Are you Hypothyroid? Here is how you can check. Let’s get started with this question: What are the symptoms of Hypothroidism? To so many of you these symptoms will be very familiar: Fatigue, Increased sensitivity to cold, Constipation, Dry skin, Weight gain, Puffy face, Hoarseness, Muscle weakness, Elevated blood cholesterol level, Muscle aches, tenderness and stiffness, Pain, stiffness or swelling in your joints, Heavier than normal or irregular menstrual periods, Thinning hair, Slowed heart rate, Depression and Impaired memory. These symptoms appear over time and the changes might be so subtle that you don’t recognize them until you have a real problem. The big one for me, and for many women out there, is the inability to lose weight. How many times have you heard “After 40 it becomes impossible to lose weight”? That probably has more to do with the state or our thyroids and not a correlation with age. If you read the first part of this series you saw that I did a NO CARB diet for 6 weeks and didn’t lose a pound. Even though that wasn’t the greatest diet choice….I still should have lost some amount of weight. That is when I knew something else was going on. High cholesterol also goes hand in hand with hypothyroidism. In many cases once you get your thyroid leveled out your cholesterol will go back to a normal range. And although this is for another blog, for the love of pete don’t let your doctor put you on a statin. Please? They are very bad and they will continue to negatively impact your thyroid making it near impossible to get it leveled out. One of the most important things about the loss of thyroid function is that our diets play a HUGE role. I will go into this in more detail in another article but so much of what is in the American diet is toxic for your thyroid. Even more shocking to learn is that a lot of the “healthy” foods we eat are also bad for your thyroid….like BROCCOLI? What? Lucy you got some ‘splainin’ to do. Wait. That will come later. I promise. How do I know if I am Hypothyroid? Now we are going to start to get at the meat of the issue. How do you find out if you are hypothyroid and what can you start doing about it. There are two ways to check on your thyroid function, and I would advise you to do both. First, you can go to your doctor and get blood drawn to get a full hormone panel done to include your thyroid. This is standard, I think in most of the once a year blood draws that your doctor does, but I would ask just to make sure. Second, you can get a basal thermometer and test your temperature at particular points during the day. This second one is easy to do and it gives you a wealth of information on what your thyroid activity is currently, plus it will give you a measuring point as you start to change some of your behaviors for future measurements. Most of you will find that your doctor is willing to do this blood work, or will tell you that they have done it in the past. If you can, get copies of any lab work you have had recently that would have this information on it. Some of your doctors will be more resistant. At first, I asked my gynecologist to run this blood work and he told me no. His reason at the time was that because a woman’s hormones fluctuate so much during the month that we wouldn’t be able to tell much in the blood work. And, at the time, I bought this explanation hook, line and sinker. The truth is that even though our hormones fluctuate there are still basic ranges that they should be in through our cycle. So, testing your hormones is never a bad thing to look at. Plus, when you are looking into your thyroid health it is helpful to know what your estrogen and progesterone levels are. I then asked my GP if he would run a basic hormone panel and he said yes. My thyroid numbers were out of whack enough that he put me on Armour Thyroid. That was about 6 years ago and as I have stated I have taken it on an off until about a year ago when I committed to taking it consistently. But I will go into the medication information a little later. The big key on blood work is finding a doctor who is comfortable running the tests and then talking about the results. This method is easy and after a quick shopping trip to Amazon you will be ready to start. The first step is to purchase a basal thermometer. You can get them on Amazon. For the most accurate reading get a Geratherm Mercury Free Basal Thermometer (the link will be in the references section at the end of this article). The only one Amazon has seems to come from England so it takes about 10-14 days to get to you. This is the MOST accurate way to get the information. There are also basal thermometers that are digital. Their reading is not as accurate but I am not going to lie to you, I started with the first thermometer and while trying to bring the reading down to neutral (in my car while driving) I whacked it on my gear shift and non-mercury stuff went all over my car. Its up to you if you want to be a rock star with the best option or make it a bit easier and use the not quite as accurate thermometer. I use the digital one most days but about every two weeks I take a whole day of reading with the mercury free thermometer and see if my other readings are way off base. Usually they are close enough. As soon as you wake up before you even get out of bed. In the afternoon around 4 or 5 pm. This one should be around 3 hours after lunch. Log these numbers for 7 days in a format where you can see the pattern. If your thyroid is acting normally you will see that your temperature ranges from 97.8 to 98.2. If your temperatures are lower than 97.8 then you (may) fall into the hypothyroid category. Also, if your temperatures are normal in the first reading but drop to below normal after eating then you also may be considered hypothyroid. Many of you will have readings that never make it into the normal zone at all. If you want to do some research on the temp/pulse testing then google Dr. Broda Otto Barnes, because he is the one who came up with this method of testing. There is a ton of information on him. If your doctor suggests putting you on a product called Synthroid or any of its derivatives say NO! Synthroid is just T4. T4 is the hormone in your body that converts to T3. T3 is the active form, but you can’t convert T4 to T3 without having some T3 already to start the process. If you just flood your system with T4 your levels of T4 will go up but only a small amount will be converted because your thyroid is not making enough T3. Basically, it will make your lab work look better but it will do virtually nothing for your symptoms. The best option is Armour Thyroid with is made from dessicated pig thyroid. It provides both T4 and T3 in the amounts that your body needs to be able to use it. Some times starting Armour Thyroid will jump start your thyroid to start producing naturally again and you will be able to come off the product. Other times you will find that you must stay on Armour Thyroid to keep your symptoms under control. The dosing of Armour Thyroid is in grains. The smallest dose is ¼ a grain and it can go up to 1.5 and 2 grains depending on the need. Your doctor will most likely start you at a low dose and monitor your progress. It is important that you articulate to him at each visit how you feel, and how your symptoms are. You may need to force the conversation about increasing the dose if you feel like you are not getting the desired response. The next article will focus on diet, exercise and other things that can help improve your thyroid function. For now, start working towards getting the data you need to show what your thyroid levels are. Once you know where you stand you can start implementing a plan to get your thyroid humming along like it should. We still have a lot to talk about like how estrogen and progesterone work in relation to your thyroid, all the diet changes you can make to help out plus some exercise recommendations which may prove to be the hardest changes to make for some of you. If you have any questions please reach out to me by email at birtdaycake@aol.com.